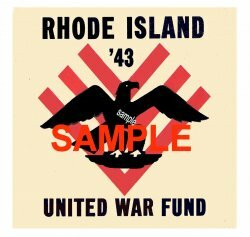 1943 RI War Fund Sticker - $20.00 : Bob Hoyts Classic Inspection Stickers, Add a Final Touch to your Restoration! This sticker was issued in 1943. This sticker as well as others can be displayed on any classic pre-war car from Rhode Island. This is a reproduction, far superior to the originals. This sticker has a peel and stick backing sheet on the front so you can peel it off and stick it to the inside window of your classic car. The paper and ink quality is one that you will want on your expensive restored vehicle.